You'll need some Adobe Lightroom and Photoshop skills for our Night Sky Workshops. If you've never used these programs, or would like a refresher that concentrates on the tools we'll use to process Milky Way images, you should register for this session that precedes the night sky trip. And what you learn will apply to your daytime photography as well. 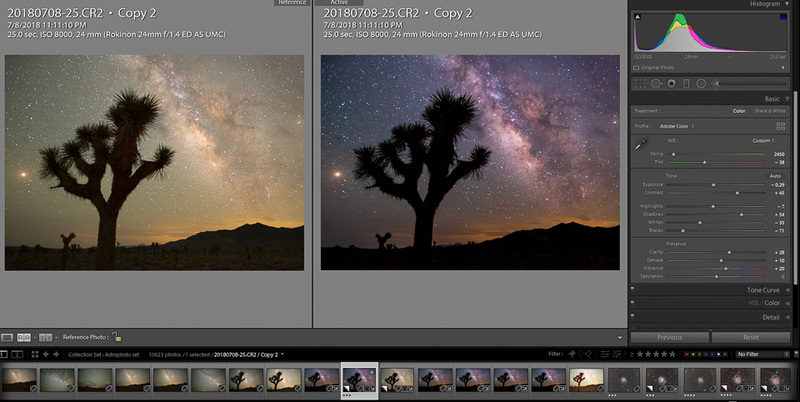 In our first night sky workshop, we found that photographers who were inexperienced with this software wished they had an introduction/refresher before the main trip. So consider this option to come up to speed. If you're unsure whether it's right for you, contact us and we'll advise you. How to set up and customize a Lightroom catalog. Import and organize your photos in Lightroom, with Collections and Keywords. Lens corrections with Adobe Profiles. Using layers and layer masks In Photoshop. The Eastern Sierra Night Sky Workshop will follow immediately after this session. We'll use these techniques and much more to process Milky Way and night sky images..